A great general purpose needle. Size 80 needles are the correct size for standard weight (50 w) cotton thread that most quilters use for piecing. 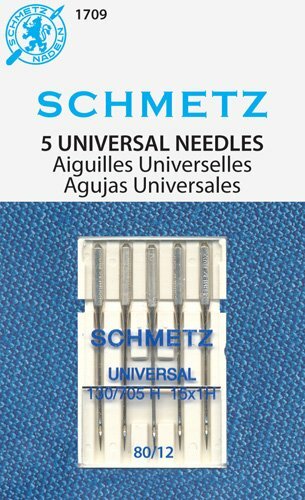 Schmetz is a quality made needle that will stay in the shaft of your Singer Featherweight. The slightly rounded point allows for trouble free sewing on numerous types of materials including both knits and woven fabrics. A great general purpose needle. System: 130/705 H. Size 12/80. 5 needles per pack. Carded.